Over the last decade, the steep growth of the pet industry has made it one of the hottest investment opportunities on the market. According to a figure released by the APPA, an estimated 68% of U.S. households own pets. That’s 85 million families, a number that is expected to soar higher with each passing year. You only need to see the inside of a veterinarian’s office to understand the scale of this fast-growing sector. Tightly packed rooms and lengthy wait times are the norm for a vet visit. All to see a chronically tired vet who will diagnose an average of 200 dogs, cats, hamsters and bunnies per week[i]. To compound the blur, the patients can’t talk or explain their problem, so things go wrong every day. Diagnoses come too late. Problems get missed. Biomerieux, IDEXX Labs, and Lexagene are working on diagnostic solutions to improve pet care and the lives of the vets as well. 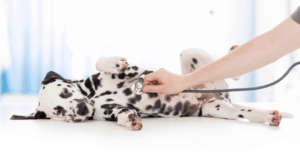 IDEXX Laboratories (Nasdaq: IDXX) is the top-selling brand in veterinary diagnostic devices[iii]. 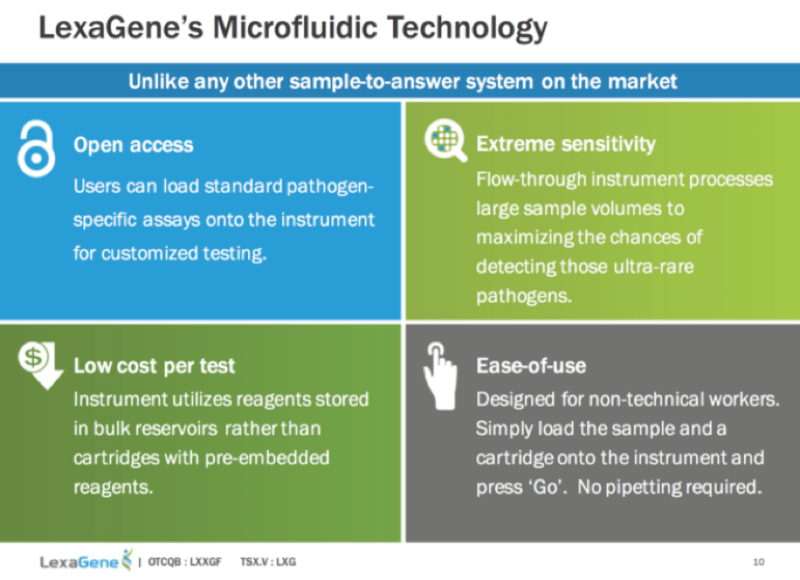 The company has excellent benchtop answers for analyzing blood chemistry, but for pathogens like E. coli or giardia, IDEXX prefers the consultant model. The vet sends a sample to be cultured, and three days to a week later a specialist gets back to them with results[iv]. Those may be old-fashioned gold-standard results, but we much prefer the newer approach of Biomerieux (Eurostock: BIM) and Lexagene (CN: LXG or OTC: LXXGF). Both of these companies are using PCR systems that quickly and accurately identify pathogens based on their genetic code. No waiting for a culture is required. Biomerieux is a French company, and to invest in it requires going to the Eurostock exchange. Its US ADR shares rarely trade. That’s just one reason we think investors should be following Lexagene (CN: LXG or OTC: LXXGF). We also think Lexagene has the most attractive proposition for vets looking for great quality, affordability, and accuracy. The best news though, is that LXXGF should be a breakout stock this year. 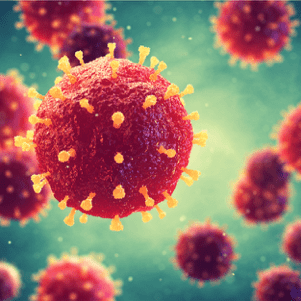 Accelerated by an injection of capital after closing a $5.7M financing deal, LexaGene just announced that it has entered into the beta stage of product development for its flagship pathogen detection system. After years of testing and perfecting it, the LX-6 is almost ready to market and will be commercialized in 2019. This device is truly rewriting the rules. The LX-6 delivers genetically-identified diagnoses even faster than Biomerieux systems. Lexagene’s LX-6 gives vets answers within 1 hour compared to 8-24 hours for the Biomerieux system. What’s more, the LX-6 is accurate and extremely affordable. But that’s not the only advantage…. Veterinary medicine is a very high stress occupation, and LXG could aim straight at some of its most significant problems. In addition to diagnosing pathogens quickly—which the LX-6 excels at—Lexagene can help vets keep their business healthy. The fact that most people don’t know how brutal the economics of veterinary medicine are. Vet school cost about $25,000 more per year than medical school. [v] But vets earn less far less. A recent starting salary for vets was $65,000 compared to $170,000 for MDs. Vets also carry the highest debt-to-income loads in medicine[vi]. Those numbers are the reason vets are pressured to see a new pet every 15 minutes while on duty—200 different patients or more per week to cover costs. While most practices can identify worms in stool samples and take X-rays, vet practices have limited equipment on hand because of costs. So they send samples out to labs, while the awaiting pet’s condition worsens. The LX-6 can rapidly pay for itself because of additional tests (and collected fees) conducted in house. The sales potential is enormous. Almost no vet practice has this kind of capability in house now. There are more than 71,000 private vet practices in the US alone[viii], and 65% of American households have pets. Customers want the kind of fast, accurate answer the LX-6 can give them. 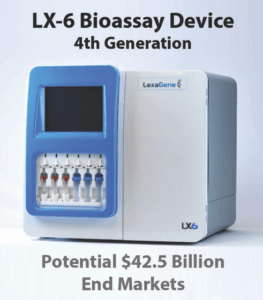 The LX-6 and Lexagene are new to market, but they are backed by years of research at prestigious institutions like Lawrence Livermore National Lab and Stanford University School of Medicine to incorporate cancer-sequencing technology into the LX-6 for medical diagnostics. And Texas A&M Veterinary School—one of the top 10 programs in the US[ix]—is testing the LX-6 for effectiveness in identifying pathogens in dog urine. Locals check for e. coli, possibly giardia when there’s a question about our drinking and swimming water. But they can easily miss other possibilities. 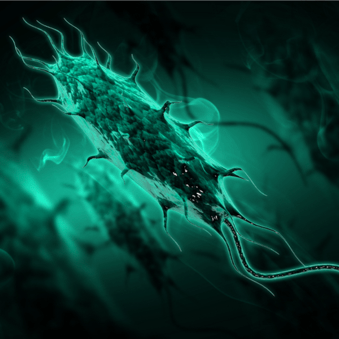 In one short hour, LexaGene’s LX6 can check for 2 species of vibrio, 3 species of salmonella, 4 species of shigella, and 2 species of e. coli. Demand for reliable food and water safety testing is at an all-time high. Reuters reports an alarming figure, “Roughly 48 million people, one in six U.S. residents, are sickened by tainted food each year and nearly 3,000 die.” Billions of dollars in lost revenue are at stake, as food producers and food chains fall victim to outbreaks of E. Coli, Salmonella, and other harmful pathogens. An absolute must have for veterinary professionals, the LX-6 could rapidly penetrate a market which is projected to be worth $18.26 billion this year. With Lexagene (CN: LXG or OTC: LXXGF) revving up to begin sales in the near term, it’s only a matter of time before the market takes notice. Take a serious look at LexaGene today and stake your position early. The assembled information disseminated by Financials Trend is for information purposes only, and is neither a solicitation to buy nor an offer to sell securities. Financials Trend does expect that investors will buy and sell securities based on information assembled and presented in Financials Trend. PLEASE always do your own due diligence, and consult your financial advisor. All assembled information within Financials Trend is subject to change without notice. The assembled information within Financials Trend is based on information supplied by the company, press releases, SEC filings, or from other sources believed to be reliable as of the date of the report on the featured companies, but no representation, expressed or implied, is made as to its accuracy, completeness or correctness. An affiliate of the Financials Trend is a registered investment advisor. Financials Trend and its affiliates and authors are not, brokers, broker-dealers, market makers, investment bankers, analysts or underwriters. Information in our emails and on Financials Trend will contain “forward looking statements” as defined under Section 27A of the Securities Act of 1933 and Section 21B of the Securities Exchange Act of 1934. An example of forward-looking information are statements relating to the future anticipated direction of the industry, plans for future expansion, various business development activities, planned capital expenditures, future funding sources, anticipated sales growth and potential contracts. These and similar forward statements are subject to a number of known and unknown risks and uncertainties outside our control that could cause actual operations or results to differ materially from those anticipated. 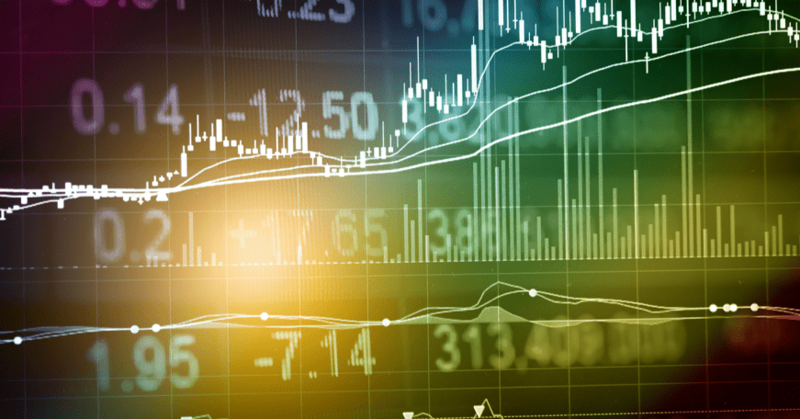 In order to be in full compliance with the Securities Act of 1933, Section 17(b), Financials Trend and its management will fully disclose if they receive fees from profiled companies or agents representing the profiled companies. These fees may be paid in cash, securities of profiled companies, or both, and will be completely disclosed in each profile. Since Financials Trend receives compensation and its employees, affiliates, or members of their families could hold stock in the profiled companies, there is an inherent conflict of interest in the statements and opinions, and such statements and opinions are not independent. Financials Trend will not be responsible for or accept any liability for any losses arising from an investor’s reliance on or use of this assembled information. This assembled information is for information purposes only, and is neither a solicitation to buy nor an offer to sell securities. All assembled information provided is for informational purposes only and is not intended to be used as the sole source of information on a company. Financials Trend disseminates information to those who wish to receive it. Small-cap and Penney stocks are considered to be highly speculative and may be unsuitable for all but very aggressive investors. Small-cap companies, micro-cap companies, penny stocks and/or thinly traded securities are inherently risky and volatile investments. You should be prepared to lose some or all of the money you invest. While historical data may be informative and positive, it should be understood there is no guarantee that past performance will be indicative of future results. Financials Trend and its affiliates or officers could buy, hold, or sell shares, of mentioned Companies, in the open market without notice. Financials Trend and its affiliates will sell its shares in the event the shares rise in value, and in most cases will sell its shares for less than target prices. Financials Trend and its affiliates will not advise as to when it decides to sell and does not and will not offer any opinion as to when others should sell; each person must make that decision based on their judgment.